I loved the look of the River Rock Slouch and Scarf, that I wanted to see how it would look as a blanket. This is an easily adjustable design because as long as your starting chain is a number divisible by 3, you can make it to suit your needs, including using different hook sizes. 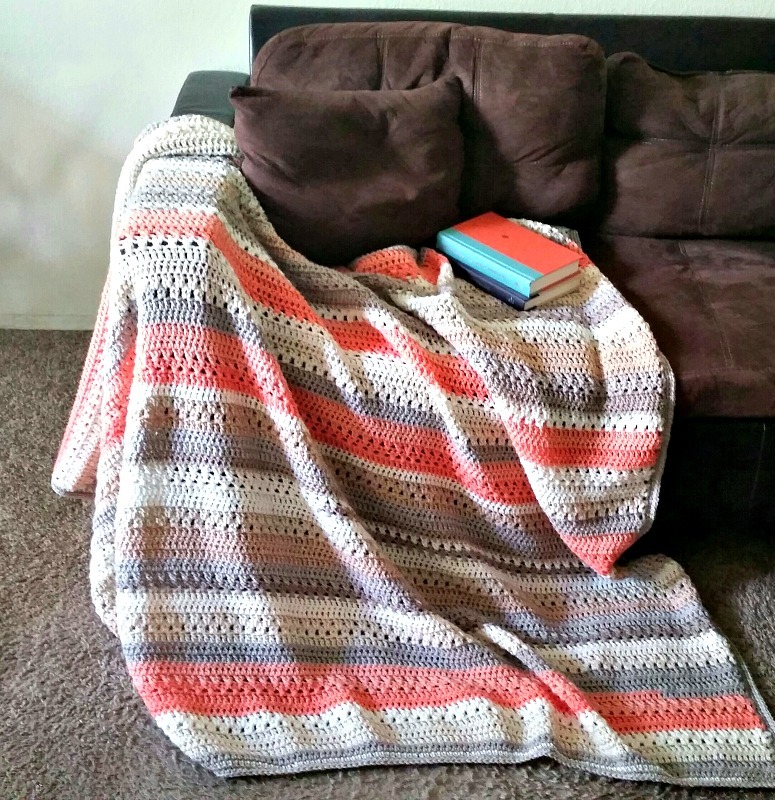 I used two different colorways because I didn’t have enough of one colorway to make this blanket. The two colors are similar so I was happy with the way it came out. This blanket as written is approximately 64x64 so a big blanket. I used 5 cakes and about half of a 6th cake. With J Hook, chain 171. Row 5 *Skip a stitch, 2 dc in next stitch, repeat from * across. End with 2 dc in last stitch. Ch 3, turn. Repeat the pattern repeat (Round 5 - 14) for your desired length, and end with a 4 dc row. Now this part is optional, you either add the edging or not. But if you want to continue with the edge, without cutting the yarn, ch 1, then 2 sc in each space on the side of the of the blanket until you get to the first corner. Do 4 sc in the corner then sc in each stitch on the bottom of the blanket until the next corner. 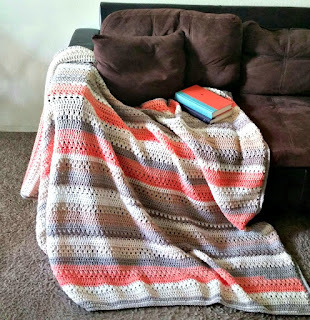 Do 4 sc in the corner, then 2 sc in each space on the side of the blanket until the next corner. Do 4 sc in the corner, then sc in each stitch across until the next corner. Do 4 sc in the corner, and then sl st in the ch 1. Just sc in each stitch across until you get to the corner. You will do 2 sc in one sc, then 2 sc in the next sc for your corner. Just repeat this until you have 4 rounds of edging. This is optional and more of a recipe so use if you want. It is a 2 dc cluster, like a granny square stitch, does that make sense? When working row 6, do we do the 2 Dc in the skipped stitch in row 4 or the large space between stitches in row 5? Hello, you are doing the 2 dc in the large spaces between stitches in row 5. At what points would you change colors? I'm having trouble figuring out where to place the first stitch in each row. Does the church 3 count at the first stitch? In row 6, it says ch 3, then 2dc in each space between, but then 2 DC at the end. Should there be only one "DC" (the ch 3) at the beginning of the row? Hello. I am wondering the same as Jules. I love this pattern but just can't figure out where to begin stitching in Rows 5 and 6 or how to end each of these rows. Yes the ch 3 counts had a dc. Hi, I’m kinda confused. I’ve ch171 and dc in 4th from hook, but I’ve ended up with 169dc instead of 168dc because I’m counting the ch3 at the beginning as a st..am I wrong?